South Indian cuisine usually consists of dishes from the five southern states of India: Andhra Pradesh, Karnataka, Kerala, Tamil Nadu and Telangana. Each state has their own variants of common dishes as well as regional specialities. Southern Indian cuisine is famous for its various spices and spicy foods as well as the significant use of coconut in their dishes. This cuisine has a brilliant blend of flavours, colours, seasoning, nutritional balance, fragrance, taste and visual appeal. Aromatic spices which form the basis of most South Indian dishes include a blend of curry leaves, coriander, cinnamon, green cardamom, nutmeg, coconut and rosewater alongside the more common spices used in Indian cooking. Traditionally a meal would be served on a banana leaf, and the meal would be eaten whilst being seated on the floor. A banana leaf is used as it provides a nice aroma to the food and improves the taste of some foods like Rasam. 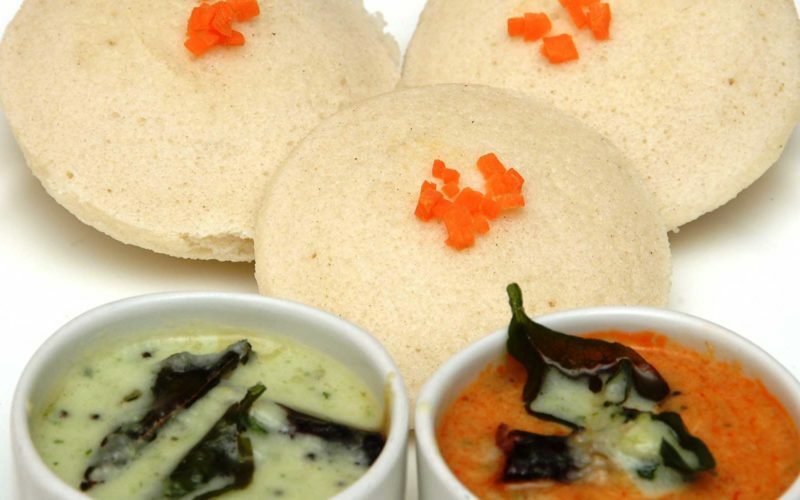 South Indian chutneys are liked by many across India, with the coconut chutney being a favourite. The main ingredients used to prepare for the variety of chutneys is coconut, peanuts, dal, tamarind, fenugreek seeds and cilantro, which is what sets itself apart to the North Indian preparation. When it comes to breakfast, South Indian provides some of the most delicious delicacies that include Upma, Appam usually served with a delicious vegetable stew and Puttu, to name a few. A rice-based pancake with mildly flavoured turmeric potatoes & onions served with sambhar and home-made coconut chutney. Thick, rice-based pancake crust topped with mixed peppers, onions and fresh coriander. Semolina cooked with nuts, green chillies and ginger served with our home-made coconut chutney. Delicious golden fried lentil doughnuts, fluffy in the middle and crispy on the outside. Deep fried home-made Idli with chillies, soya sauce, pepper, onions and stir fry sauce. Vegetables cooked in lentils and coconut with home-made spices. Fried coconut and cashewnuts folded into freshly boiled basmati rice, drizzled with ghee and garnished with coriander leaves.